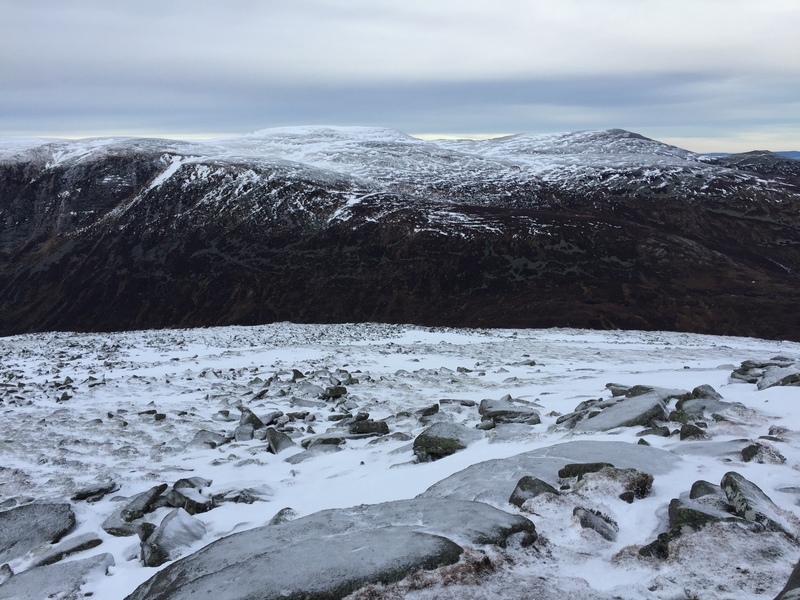 THE snowline may have been high but it felt as though winter had stamped its first real icy footprint on the mountains last weekend, a proper statement of intent. Iced rocks, deep pockets of snow in the hollows, and a bitter wind blowing across a bleak but beautiful landscape lit faintly by a low sun just cresting the horizon. There was also a significant drop in the numbers venturing out. We met just two walkers on the hill, and the normally busy car park at Glen Doll had less than half a dozen vehicles scattered around. As expected, the social media sites were buzzing with spectacular mountain photographs and comments, but there was another recurring theme amongst all the tweets and posts. They seemed to have taken on the mantle of a lost and found section. A glove dropped here, a camera lost there, walking poles left behind, hats, maps, cases missing. It happens all year round, of course, but it appears more common during the shorter days. On our descent from Broad Cairn on Sunday, we first found a hat, frozen solid, among the boulders. Further down the track we picked up a sock, further on again a single glove. We did start to wonder what would turn up next, although we did all mentally draw the line at litter picking if it happened to be a pair of dishevelled underpants. It was as if a naked rambler had been performing a slow striptease on descent, but the one sock suggested any masochistic intent had quickly evaporated in the cold reality or that the perpetrator was a descendent of Long John Silver. Everyone who goes out on the hills will have tales to tell of gear going astray. Most will also have gathered a fair amount during the same period. Over the years, I have found everything from water bottles to Berghaus jackets. No matter how careful you are, setting off at first light and then returning to get changed in the dark is bound to increase the odds of a mishap. Just the other week I noticed that one of my glove liners was missing when I was halfway up Beinn a' Chlachain above Applecross. I had stopped to take a picture of a lochan just seconds earlier and must have dropped it then. It couldn't be far away, but I was loath to spend time searching for it with daylight disappearing fast. That hill was to prove costly in the gear stakes. It was pitch dark and bitterly cold when I reached the car, and I was in a hurry to remove my wet boots and socks. I hung the damp socks over the car door while I changed to drier clothing. Now warmer and happier, I set off for the half-hour drive back to base. Unfortunately, in the darkness, I had failed to remove the socks from the car door, so they remained there the whole time, now invisible wind socks billowing in the slipstream. When I finally opened the car door again, they fell out. I know this because I found one the next morning. The other was lost somewhere along the coast. I once realised that I had left a good pair of winter gloves on the summit of the remote Sgurr nan Ceathreamhnan but the thought of re-climbing more than a thousand feet to recover them was too much. I hope they found a good pair of hands. I have also watched a map and case fly away from the deck of a boat but that's another story. 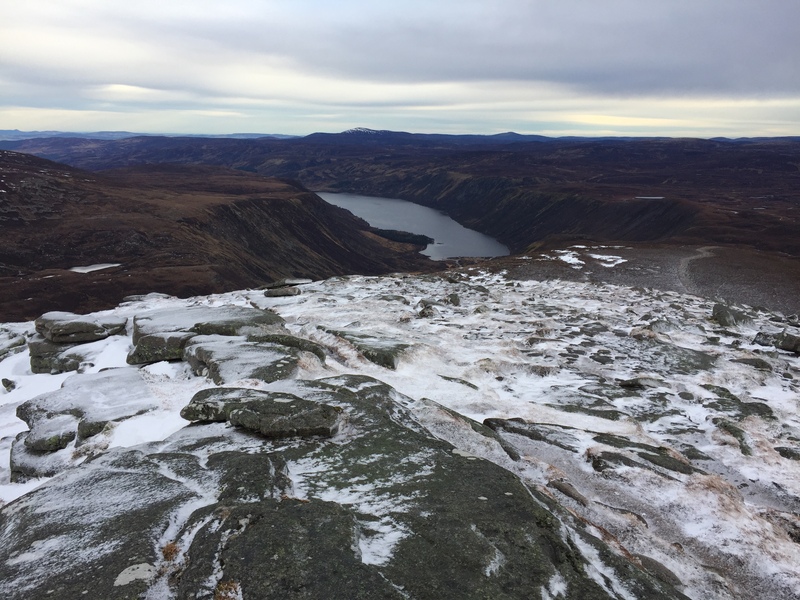 During a recent night walk on Lochnagar, one of my companions noticed too late that his map, case and compass was gone, ripped from his backpack during an uphill struggle in high winds. Our day of finds on Broad Cairn didn't end when we got back to the cars. On the drive out in the dark, we encountered two lads from Manchester who were lost and a little confused. Their car was at Spittal of Glenmuick and they had gone for a walk around the loch, but had someone managed to end up in Glen Doll. They had either come over the Capel Mounth path or via Bachnagairn, but they couldn't really tell us which. They had been navigating by a map on their phones. It's only a couple of hours walking back over the pass, but in darkness and with the weather closing in that wasn't a good option for anyone who didn't know the terrain. They were considering a taxi but the return by road is huge and it would have cost a small fortune. 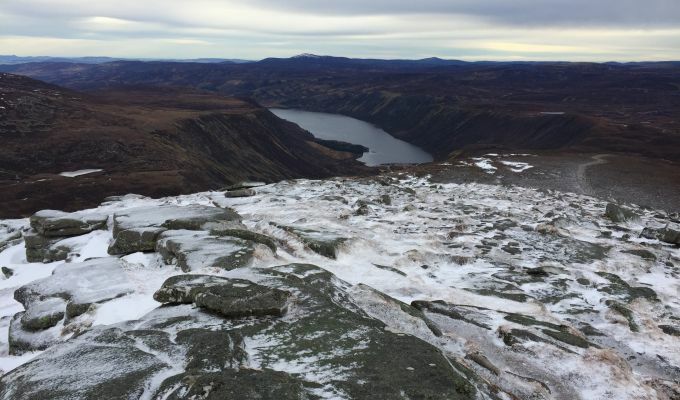 In the end they settled for the more sensible option – a night at the Clova Inn and a walk back the next day in better conditions.